Triple H gets slapped down on SmackDown. 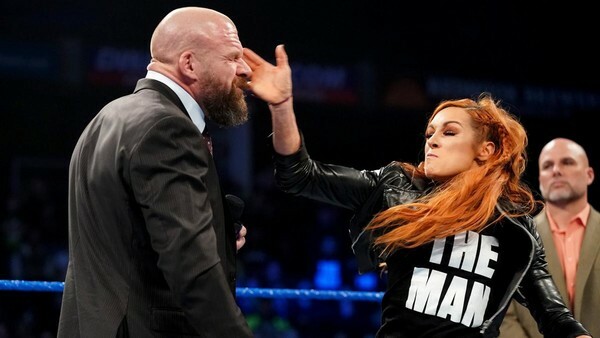 24 hours removed from beating the hell out of Stephanie McMahon on Monday Night Raw, a suspended Becky Lynch swaggered into SmackDown on her one good leg, exacerbating the tension between her and the WWE hierarchy by slapping Triple H's head clean off his shoulders. The 'Stone Cold' parallels have never been so overt. Becky lives by her own code, operates in shades of grey, and loathes authority. It's 'The Man' versus The Man, and much of your enjoyment of this week's episode will depend on how you feel about Lynch's transition into a full-on expy. A quick glance at the Ups-to-Downs ratio should make your writer's stance clear. Though highlighted by Lynch & co., this excellent SmackDown episode brought chaos to the Elimination Chamber, as Jeff Hardy, Daniel Bryan, Randy Orton, Mustafa Ali, AJ Styles and especially Samoa Joe shot their respective shots. 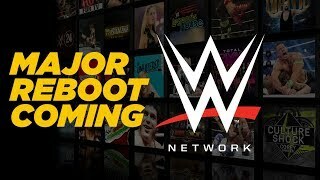 Elsewhere, there was a Women's Tag Title preview as The IIconics, Sonya Deville and Mandy Rose, and Carmella and Naomi faced off, Paige made her low-key return to WWE television, and Rusev and Shinsuke Nakamura's frenemy status was confirmed. A caffeine-dependent life-form from the frozen wastes of north east Scotland. He once tried to start a revolution but didn't print enough pamphlets, so hardly anyone turned up. Give him a follow @andyhmurray. You'll have a great time. Maybe.